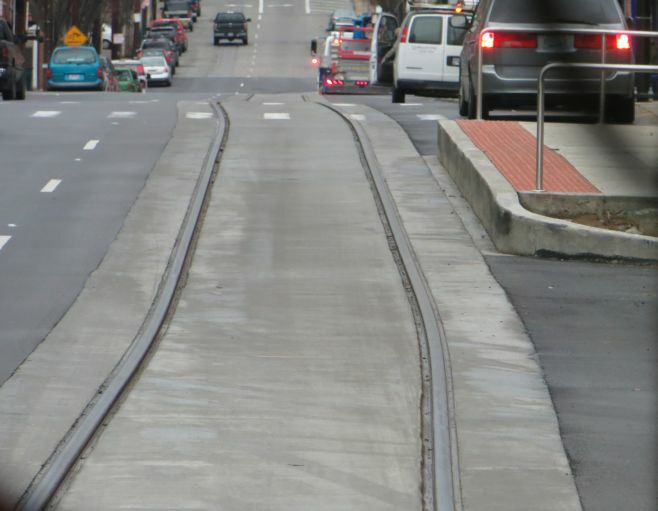 Cincinnati streetcar, provided by CAF, under live power testing in 2015. Photo via Dilemma-X. For a while, eager naysayers and rail transit critics said the return of streetcars to American streets — the modern-day streetcar renaissance — was over. They brandished problems with various streetcar projects, including the political cancellation of a line in Arlington, Virginia, missteps with Washington, DC’s new streetcar project, troubles with rolling stock procurements in Oklahoma City, and political cancellation of the planned streetcar starter line in Providence, Rhode Island. 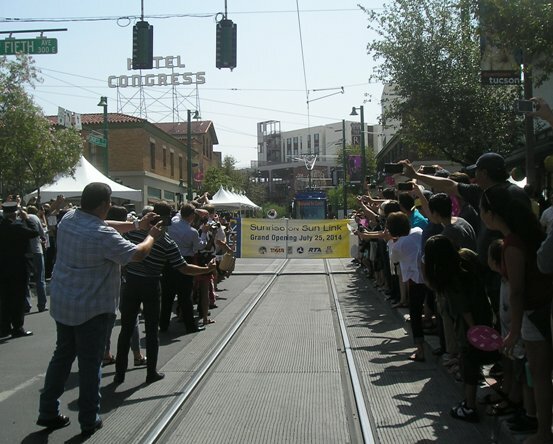 • Seattle — First Hill Streetcar, an expansion of the original streetcar system that began with the South Lake Union line, opened January 23rd. The 2.5-mile-long project was installed at a cost of $134 million. • New Orleans — The Regional Transportation Authority’s 1.6-mile North Ramparts-St. Claude Streetcar Line Project, budgeted at $40-41 million, is nearing completion, with opening expected this summer or early fall. 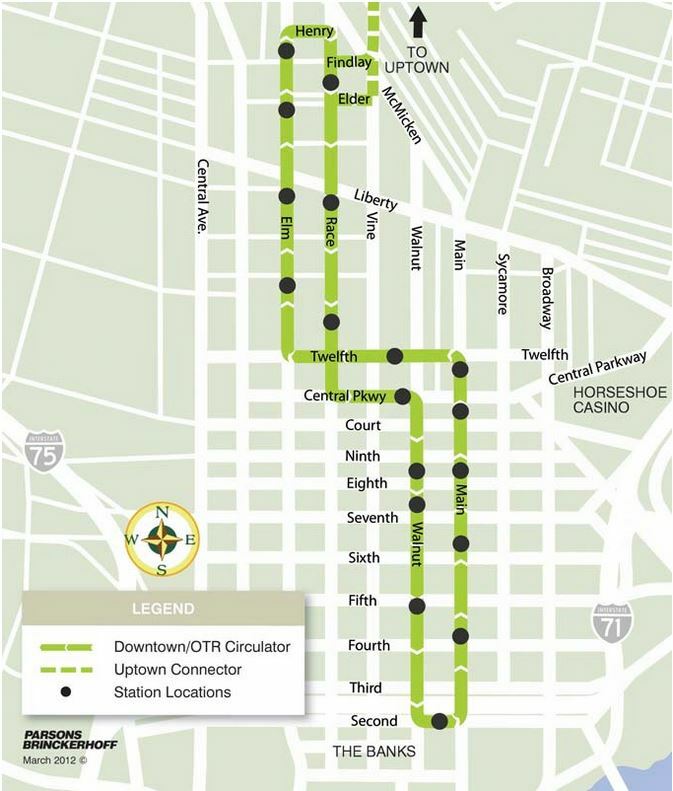 • El Paso — The city’s 4.8-mile heritage streetcar line project, budgeted at $97 million, is now under way, with the legacy fleet of stored historic PCC cars now being renovated and restored by Brookville Equipment Corp.
• Oklahoma City — A 4.6-mile, $129-million streetcar starter line project continues to proceed, with rolling stock supplier designated as Brookville Equipment Corp.
• Milwaukee — The city’s 2.1-mile, $124-million downtown streetcar starter line project is now well under way. 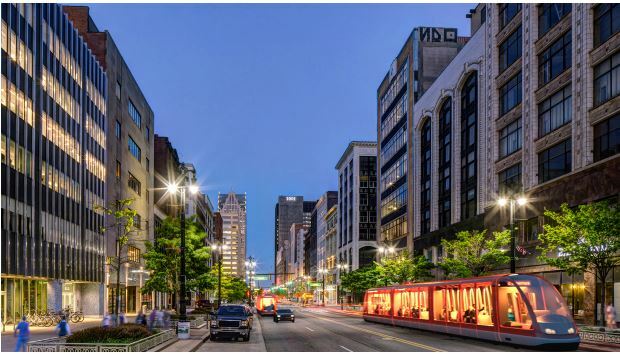 • Detroit — The 3.3-mile, $140-million M-1 streetcar project, mainly routed on the city’s iconic Woodward Avenue, continues to move ahead. • Kansas City — The 2.2-mile-long, $102-million project is nearing completion, and expected to open in a few months. 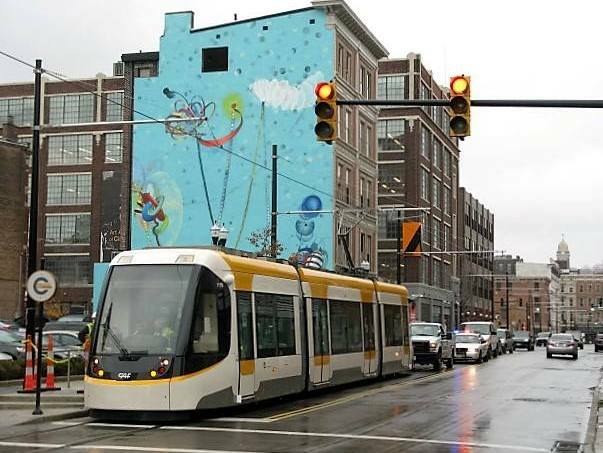 • Cincinnati — The city’s 1.8-mile, $148-million core area streetcar project (see photo at top of post) is nearing completion, and expected to open this fall. • Washington, DC — Officials are now hoping the problem-plagued, long-delayed 2.2-mile H St.-Benning Rd. streetcar project, costing approximately $200 million so far, will at last be completed and able to open within a few weeks. 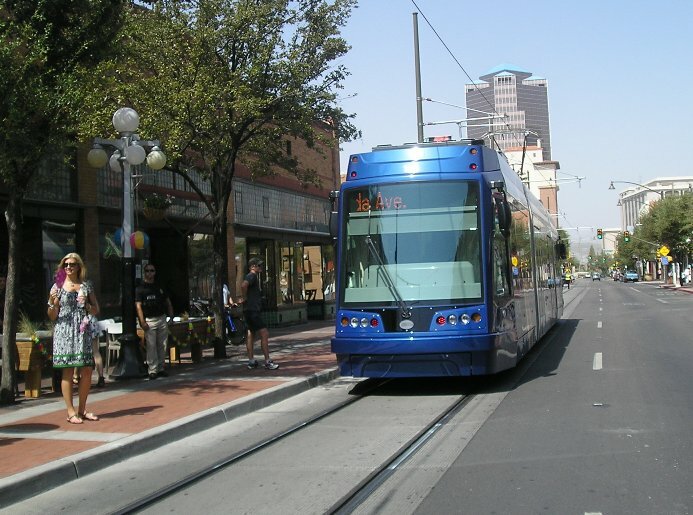 • Tucson — The city’s 3.9-mile Sun Link streetcar starter line, opened in 2014 at an investment cost of about $199 million, continues to exceed its ridership projections. LRT car clearances profile (excerpted from presentation). Interested in designing a conceptual light rail transit (LRT) line for your own community? If you’ve been wishing you had something like a Do-It-Yourself (DIY) planning manual or set of basic guidelines for doing that, a report presented to the 13th National Light Rail & Streetcar Conference (co-sponsored by Transportation Research Board and American Public Transportation Association, and held last month in Minneapolis, Minnesota) may be just what you need. John Schneider, Cincinnati’s “Mr. 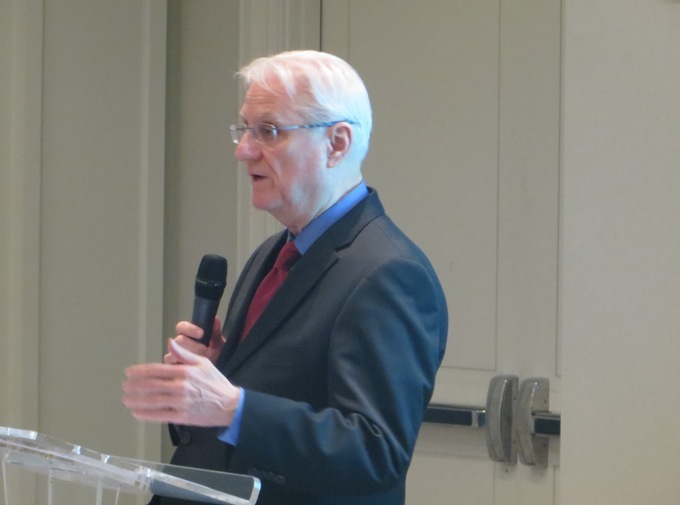 Streetcar” and a co-principal of Urban Rail Today, addresses APTA Streetcar Committee meeting on Dec. 15th. Photo: L. Henry. 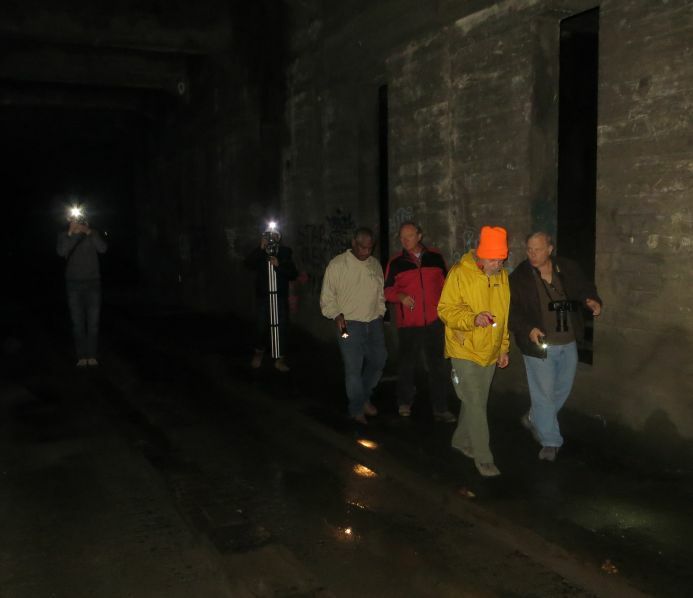 APTA tour group walking through darkness of Cincinnati’s never-finished subway on morning of Dec. 14th. Photo: L. Henry. 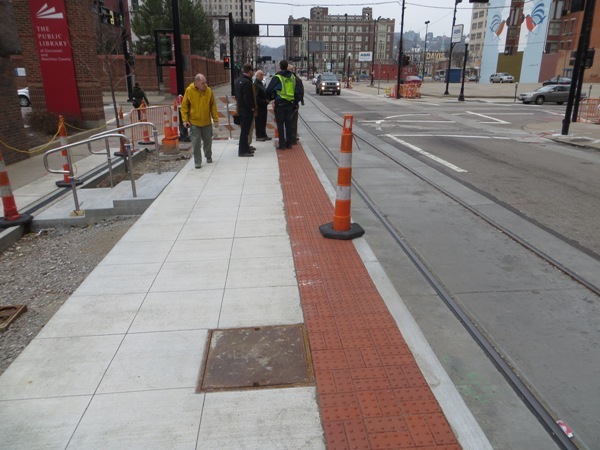 Most of Cincinnati’s modern streetcar starter line project is now under construction, and particular features were inspected via another APTA Streetcar Committee tour on Dec. 16th. It’s a roughly 1.8-mile route, end to end, with about 3.6 miles of track and 17 stations. As the map below illustrates, the route has a sort of elongated “Figure 8” configuration, forming a long, narrow loop with tracks for each direction on parallel streets — no double track. Map of Cincinnati’s Phase 1 streetcar project, the first phase of hopefully a much larger urban rail system for the city. Map: City of Cincinnati. In the middle segment where the alignment runs east-west for a short distance, the bottom (southern) track is routed in the median of Central Parkway, and the upper (northern) track along 12th St. Central Pkwy. was constructed atop the site of an old canal, and it was this canal that got drained and converted into the ill-fated subway that never opened. Cincinnati’s famous Over-the-Rhine (OTR) district is the area above (i.e., north of) Central Pkwy. The district once was home to a substantial population of German immigrants who dubbed the old canal the “Rhine”. The area declined over the many decades since the subway debacle and the rustbelt decline of Cincinnati, but the neighborhoods adjacent and near to the streetcar line are experiencing quite a revival. 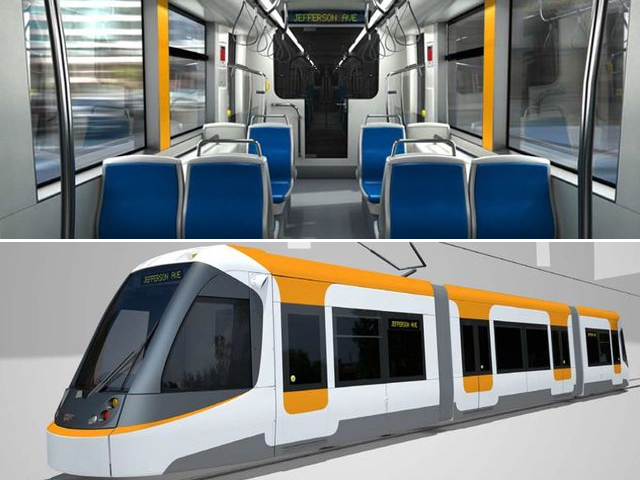 Streetcar rolling stock is being supplied by the Spanish railcar manufacturer CAF through their U.S. subsidiary CAF USA. Five cars for the starter line will be the first 100% lowfloor streetcars deployed in America (see simulation graphic below). Each will be 23.6 meters (77.4 feet) long, with four doors per side, 32 seats, and a total capacity of 154 passengers. Up to 6 bicycles can also be accommodated in the car. CAF Urbos 3 streetcar for Cincinnati. Top: Interior. Bottom: Exterior. Graphic: CAF. CAF’s Urbos 3 car is actually a fully robust light rail transit (LRT) car adapted for streetcar application. The cars are double-ended (i.e., bidirectional) with a maximum speed capability of 70 km/h (about 43 mph). As illustrated in the photo below, the streetcar project is being constructed predominantly with curbside tracks and stations that simply protrude outward from the sidewalks. 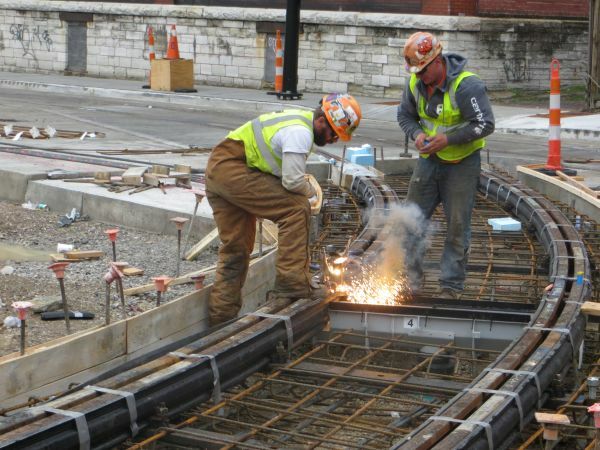 Members of APTA Streetcar Committee inspect streetcar station-stop under construction on Walnut St. in Cincinnati CBD. Photo: L. Henry. 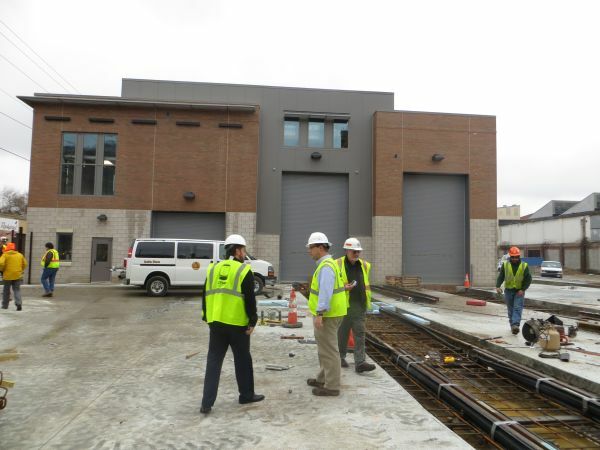 The photo below shows a completed section of track next to a station in the OTR district. The track diverges slightly toward the station platform, in part to minimize clearance needed for the platform edge and to maximize clearance with respect to the parking lane. Completed section of streetcar track veers slightly toward station platform. Photo: L. Henry. 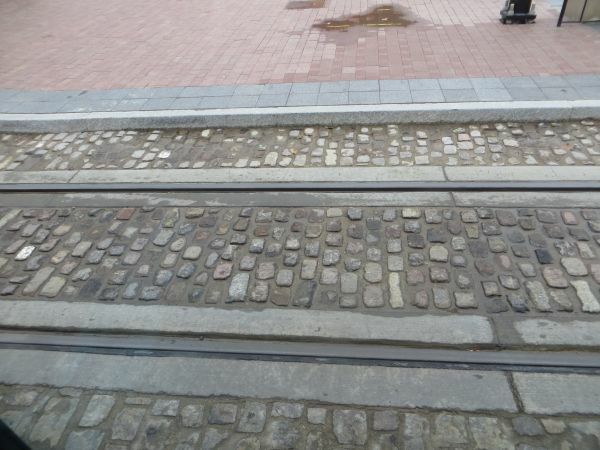 Section of streetcar track embedded in cobblestone paving. Photo: L. Henry. The system’s initial carbarn (storage-maintenance-operations facility) is under construction at the north end of the current route, at Henry St. The photo below, looking south, shows the main building and part of the storage yard. While the system will start with just five cars, the facility has space for 13. The revenue track wraps around on Henry St., on the carbarn’s north side (i.e., behind the camera in the photo below) to effectively reverse direction and head southbound. Carbarn main building and portion of streetcar storage yard under construction. Photo: L. Henry. In the photo below (facing north, toward Henry St.), track workers are performing thermal welds on one of the fan tracks leading into the carbarn. The street just beyond them is Henry St., which streetcars will use to turn from northbound to southbound and thus loop around the carbarn. Workers performing thermal weld on track leading into carbarn storage yard. Photo: L. Henry. Proposed alternative Plan B for Austin’s Guadalupe-Lamar corridor would also have branch serving re-purposed Seaholm power plant site and Amtrak station. Graphic: Project Connect. 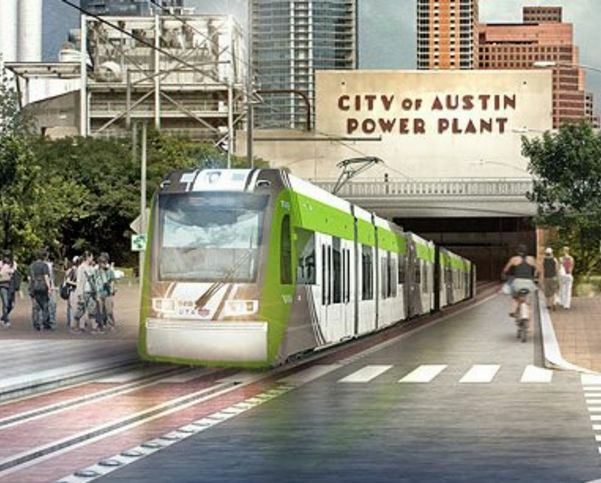 Austin, Texas — Sometimes there are rail transit plans (and other urban development proposals) that are just plain misguided and potentially deleterious to a city’s best interests. That was the case with the urban rail scheme proposed for Austin, resisted by some of the city’s most dedicated and savvy rail advocates, and rejected by voters on Nov. 4th by a 14-point margin, 57% Against to 43% In Favor. Not only was it a seriously flawed route, but it was also seriously over-designed (I called it “gold-plated”). Encountering formidable alignment challenges (e.g., constricted rights-of-way, sharply tortuous curves, a river crossing, and an in-roadway crossing over I-35), the proposal called for a pricey “signature bridge” and a $230 million subway for which the need was in dispute. As a result, the plan would have calculated as the third most expensive LRT starter line in U.S. history. And that massively wasteful encumbering of local funding capability would have, in effect, “sucked the oxygen” from local resources and strangled further rail development and expansion. But high cost wasn’t the worst problem with the Highland-Riverside proposal (after all, even a good, cost-effective plan could have a high pricetag). Instead, mobility needs were virtually sidelined in deference to local development objectives (and these were basically misguided). Fundamentally, the plan ignored the city’s most central heavy-traffic local corridor, defined by two major arterials named North Lamar Blvd. and Guadalupe St., which funnels major travel from the northwest, north, and northeast through several miles of activity concentrations and finally into the Core Area — the University of Texas, state Capitol Complex, and Central Business district (CBD). Potential daily LRT ridership serving this corridor has been assessed in the range of 30,000 to 40,000 — roughly 2-3 times that of the now-defunct Highland-Riverside plan. And this relates directly to urban development: By and large, developers will invest and build where the ridership is. Mobility is the key — provide a solid mobility project, and development will follow. In any case, urban rail must first and foremost make bona fide mobility sense as well as meet appropriate urban development needs. Urban rail shouldn’t be intended as just a pricey amenity to enhance urban development. That’s where Project Connect’s rail plan fell way short. But, in contrast, what has all the hallmarks of a real winner of an extremely cost-effective alternative plan is emerging to take its place, this time in the crucial Guadalupe-Lamar corridor. Currently referred to as Plan B, the latest version of this alternative proposes a 6.8-mile LRT starter line running from the major North Lamar Transit Center at U.S. 183 into the Core Area. Along the way, the line would connect with Austin’s existing MetroRail regional passenger rail service and serve a spectrum of major commercial and residential developments, established neighborhoods, and activity centers — plus the West Campus, with the third-highest residential density in Texas. All of this was missed by Project Connect’s plan. 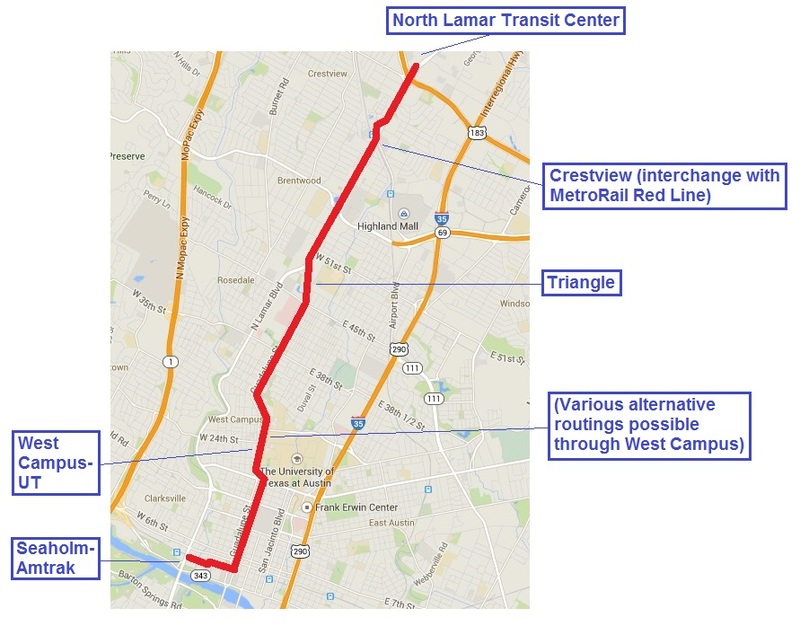 See: A “Plan B” proposal for a Guadalupe-Lamar alternative urban rail starter line. Plan B LRT line would stretch 6.8 miles from a major transit center on the north to the CBD, with a branch west to the Seaholm-Amtrak development site. 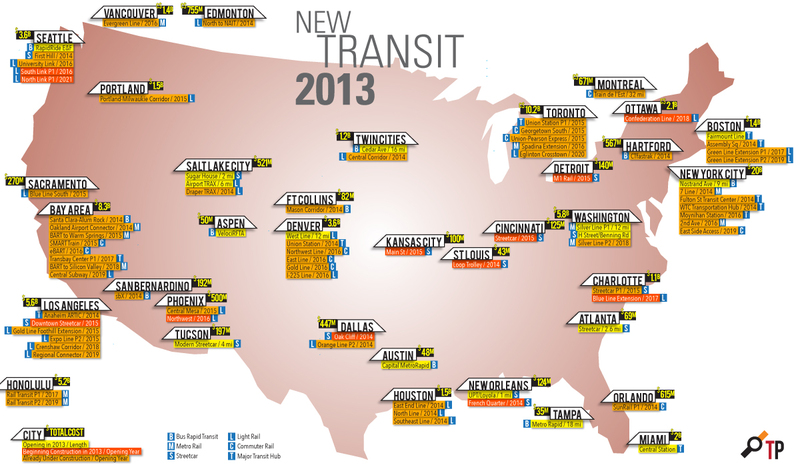 Map: Austin Rail Now. This version of Plan B LRT for Guadalupe-Lamar also includes a branch from downtown west to a major development site at the city’s former Seaholm power plan, adjacent to the Amtrak train station (a connection originally proposed by Project connect but missing in the final 9.5-mile highland-Riverside plan). In addition to striking the right balance between meeting mobility needs cost-effectively and catalyzing desirable development, there’s an additional major lesson to be gleaned from Austin’s recent urban rail planning and voting experience: Connect with the grassroots community. Much of the Austin community’s discontent with Project Connect’s “study” process (mainly from June through December 2013) resulted from a sense of alienation from the process and the proposed plan that emerged from it. Project Connect claimed a vigorous “public participation” program, with dozens and even hundreds of “meetings”. But, rather than true community meetings, facilitating bona fide discussion and community decisionmaking, and enabling various segments of the community to interact with one another, the official “participation” process mainly involved presentation events, with project personnel unveiling decisions reached in seclusion by the project team. Members of the community, excluded from this process, were typically given the opportunity merely to select among a handful of choices; meanwhile, the major structure and contours of the plan were determined by political officials and project team staff. Hopefully, this will change substantially — particularly with a new, expanded City Council, elected via a new district structure. Community activists and rail transit advocates have been interacting with new political leaders in an effort to institute a more democratic process with grassroots representation and participation directly in the development of plans. Perhaps this kind of grassroots process will materialize in a way to shape and advance the prospects of Plan B light rail for Guadalupe-Lamar. Artist’s rendition of how the streetcar operation may look on Woodward Avenue when it’s completed. Graphic: M-1 Rail. Detroit, Michigan — As tracklaying begins on this city’s key central arterial, Woodward Avenue, the M-1 Rail project at last seems to actually be getting under way. The 3.3-mile, $136 million project, financed by a combination of government and private sources, would in effect restore a tiny fragment of Detroit’s once-extensive urban streetcar system. The Woodward line carried the heaviest ridership in the system. What we saw with this M1 project … was again the strength, determination and mettle of a great city that has a vision not only of a transportation asset that takes people to jobs, but in fact one that brings jobs to the people by revitalizing a critical part of Detroit. First Siemens streetcar being readied for testing in the dead of night to minimize traffic disruption. Photo via Atlanta Curbed website. 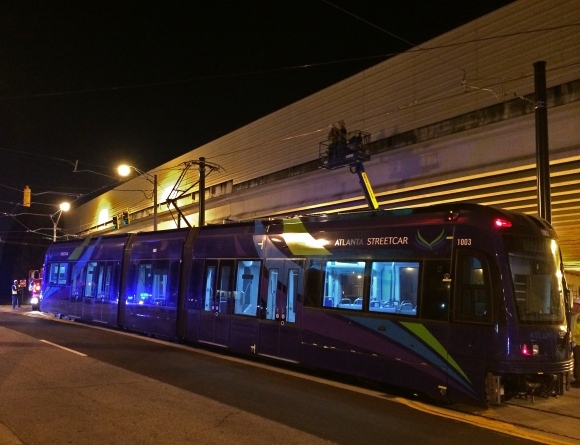 In the wee morning hours of Saturday Aug. 16th, Atlanta’s 2.7-mile modern streetcar line experienced the first actual streetcar rolling over its tracks. In a test, towed by a large truck, one of the first Siemens S70 streetcars to arrive in the city completed its initial test without power. The test checked clearances at all 12 streetcar stops as well as track alignments throughout Atlanta’s downtown. 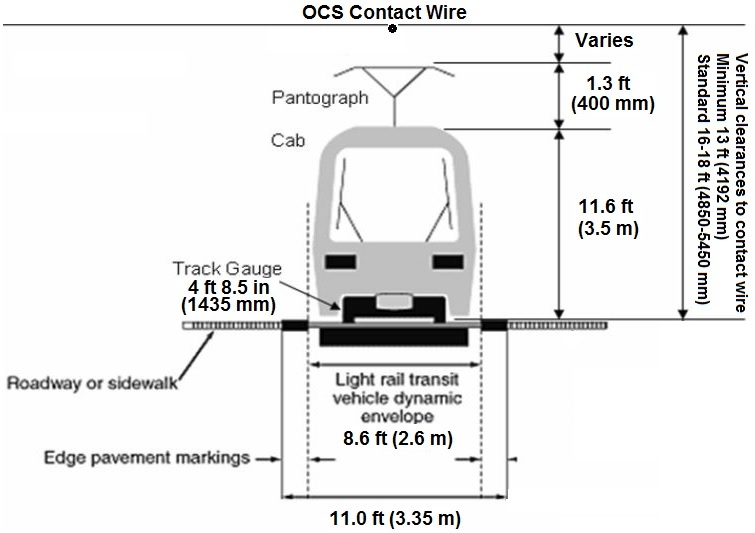 Subsequent tests will be conducted with rolling stock under power from the 750-volt overhead contact system (OCS) — in this case, a simple trolley wire. Thanks to news reports from WXIA-TV and WSB-TV, and summary information from Ed Havens posted on the LRPPro Internet forum.